A revolutionary triple-blade shaving system for the closest shave ever in fewer strokes - with less irritation. FREE Delivery & Removal as well as Price Matching*! Best value is guaranteed when you buy the Braun 3060MGK 8-in-1 Grooming Kit With Gillette Fusion Pro Glide Manual Razor from Appliances Online. Trusted by over 350000 customers - Appliances Online Legendary Service! Gillette Sensor 3 Disposable Razors 8 Pack are quick and easy to rinse, provide a smooth and comfortable shave and employ a unique non-slip rubber handle for complete control and grip. Perfect for travel or a welcome addition to any personal care kit. 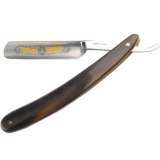 Dovo Cut Throat Razor White 5/8"